What is a choledochal cyst? What are the symptoms and complications of choledochal cysts? How are choledochal cysts diagnosed? How are choledochal cysts treated? 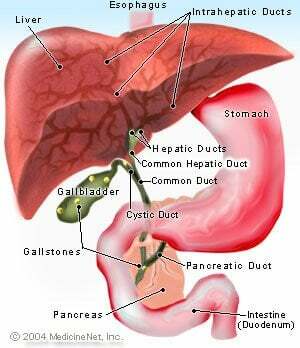 Bile that is produced in the liver flows through increasingly larger channels (ducts) within the liver and finally into even larger ducts that leave the liver, pass through the substance of the pancreas, and then empty into the duodenum. A choledochal cyst is a cyst (hollow outpouching) of the bile ducts. Choledochal cysts have been classified into several different types depending on where they are located and whether they can be seen as separate structures from the ducts (diverticulum-like); or whether they can be seen as a localized dilation (enlargement) of the ducts. Choledochal cysts are rare. The cause of choledochal cysts is unknown, but they are congenital, that is, present from birth, and, therefore, represent developmental abnormalities of the bile ducts in the fetus. In infants, choledochal cysts usually lead to obstruction of the bile ducts and retention of bile. This leads to jaundice and an enlarged liver. If the obstruction is not relieved, permanent damage may occur to the liver - scarring and cirrhosis - with the signs of portal hypertension (obstruction to the flow of blood through the liver) and ascites (fluid accumulation in the abdomen). There is an increased risk of cancer in the wall of the cyst. In older individuals, choledochal cysts are more likely to cause abdominal pain and intermittent episodes of jaundice and occasionally cholangitis (inflammation within the bile ducts caused by the spread of bacteria from the intestine into the bile ducts). Pancreatitis also may occur. The cause of these complications may be related to either an abnormal flow of bile within the ducts or the presence of gallstones. Choledochal cysts can be diagnosed in several ways. The most common is by ultrasonography. The second most common way is by cholangiography, that is, the filling of the bile ducts with dye followed by x-ray imaging. The dye may be injected by a long needle directly into the bile ducts by advancing the needle through the skin and liver into the ducts or with an endoscopically-placed catheter from the duodenum through the Papilla of Vater (the point at which the bile duct enters the small intestine, also known as the Ampulla of Vater). The most recent technique for identifying choledochal cysts is magnetic resonance imaging of the bile ducts, also known as MRCP. It offers the advantage of being non-invasive requiring neither an injection into the bile ducts or endoscopy. The best way of treating choledochal cysts is to surgically remove them and reconstruct the bile ducts that were affected. The cyst should be completely removed whenever possible. If the ducts cannot be reconstructed, they should be sewn to the intestine so that bile can drain freely out of the ducts. Please describe your experience with choledochal cyst. What were the symptoms of your choledochal cysts? What was the treatment for your choledochal cysts? a parasitic infection called schistosomiasis. vomiting blood and blood in the stool. decreased white blood cell counts.